This hack turns the Sony SmartWatch into a wristwatch. Functionally it’s not all that impressive. But the journey to get to this point represents quite a bit more. This example features an animated tea pot using a 3D rendering engine ported over to the device. [Federico] started work on the project soon after hearing that Sony had released details about developing for the hardware. He dug into the documentation but soon found it lacked the depth he needed to get a handle on bare metal work. He shelved the project for a while until coming across the Astrosmash project we featured in June. That used a wrapper that allows Arduino sketches to run on the watch. After studying how that’s done he had enough background to port this code. We’re still waiting to see a really innovative hack for the watch. But we’re glad to see progress with each new proof of concept like this one! 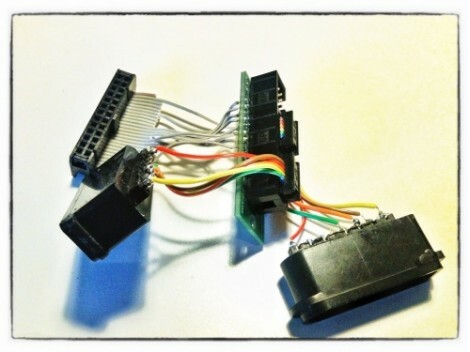 This lovely set of wires lets [Florian] connect stock Super Nintendo controllers to his Raspberry Pi. The IDC connector in the upper left plugs into the GPIO header on the RPi rather than going the route of using an intermediary USB converter. The setup lets you connect two controllers at once, so you’ll have no trouble going head-to-head on Mario Kart as seen in the clip after the break. The ports themselves were pulled from a pair of SNES extension cables. Since button signals are pushed to the console via a shift register there’s just five wires needed for each (voltage, ground, data, clock, and latch). As far was we know the Raspberry Pi pins are not 5V tolerant so you probably want to add some level conversion to this circuit if you build it yourself. [Florian] wrote a C program which shifts in data from the controllers and converts it to HID keyboard inputs. This should make it extremely flexible when it comes to emulator setup, and using the technique for different styles of controllers should also be pretty easy. [Nathan Long] sent in two fairly simple mods he’s been working on. The first is the control of Woot-off Lights via LPT port. A computer checks Woot for the Woot-off logo, and if the logo is spotted, on go the lights. 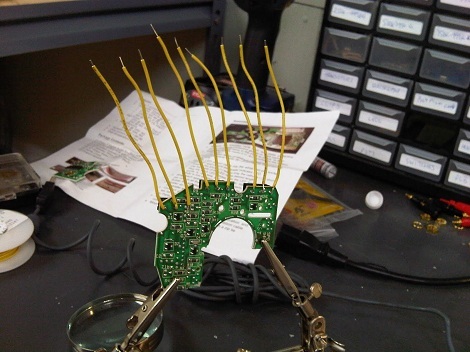 It’s really just a twist on the LED/Arduino email message system, but the creativity is nice. His other modification is the stuffing of a Microsoft Intellimouse inside of a Logitech Wingman. With the goal of giving the old PS/2 mouse USB capabilities and removing the terrible ball. For those that are asking themselves “why bother? Terrible ergonomics, no scroll wheel, etc.” [Nathan] claims it’s for Quake 2 nostalgia, to each their own we suppose.